Minford is 4-3 as a team since the return of senior point guard Darius Jordan, including a home win over Valley Saturday night. MINFORD – Hot shooting, grind it out defense, and consistent scoring options are what the Minford Falcons used to pick up a home win over Valley Saturday night, 68-60. To start Saturday night’s contest, it was all Minford, and early. The Falcons jumped out to a 23-11 lead going into the second quarter after starting the game on a 18-6 run, and only extended that lead as the first half continued. Through the first four minutes of the second quarter, Minford held Valley scoreless and held a 31-11 advantage over the Indians. The main reason for the Minford lead early was not only the Falcons ability to shoot the ball, but the balance they had when doing so. By game’s end, Minford had all five starters in double figures led by senior Kelton Kelley who finished with a game high 22 points. The script flipped to begin the second half. Valley began things on a 7-0 run to cut their deficit to ten with five minutes to go in the third quarter. 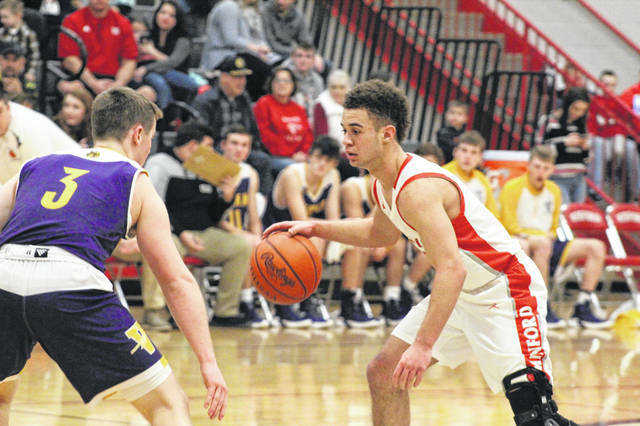 The closest things would get for Valley would be 64-60 with just under thirty seconds to play, but in the end, it was Minford who came away with an eight point home conference win over their neighboring school, and a big part of that was the performance of senior Darius Jordan. Valley was led in scoring by Andrew Shope who finished with a team high 18 points. Minford hosts one of the best teams in Division III on Tuesday, Eastern Pike, in what should be a good measuring stick game for the Falcons as tournament play approaches following the end of the regular season. Valley will be back in action on Friday as the Indians travel to McDermott to face Northwest.